The Skullcandy Crusher. A headphone with 'bass you can feel' – this product was made for an interactive experience. That face. The interactive experience was to be built around the 'bass you can feel' and the face that is pulled when you first feel it. The iPad app was used firstly as an attractor app, to pull customers across to Skullcandy products instore and then as a tool for showcasing the unique feature of the headphone. Once the user puts on the headphones and touches the screen the track starts. 10 seconds in to the track, the base kicks in and the iPad takes a video and a series of photos to catch the surprised and shocked faces of the customers. They are then added to a gallery within a campaign microsite and can be shared directly from the app. Supporting the product's marketing through the pre-launch phase, the gallery helped to drive visitors to the microsite to view further campaign promotion, the Crusher's athlete endorsed video and an interactive headphone area for discovering technical features. 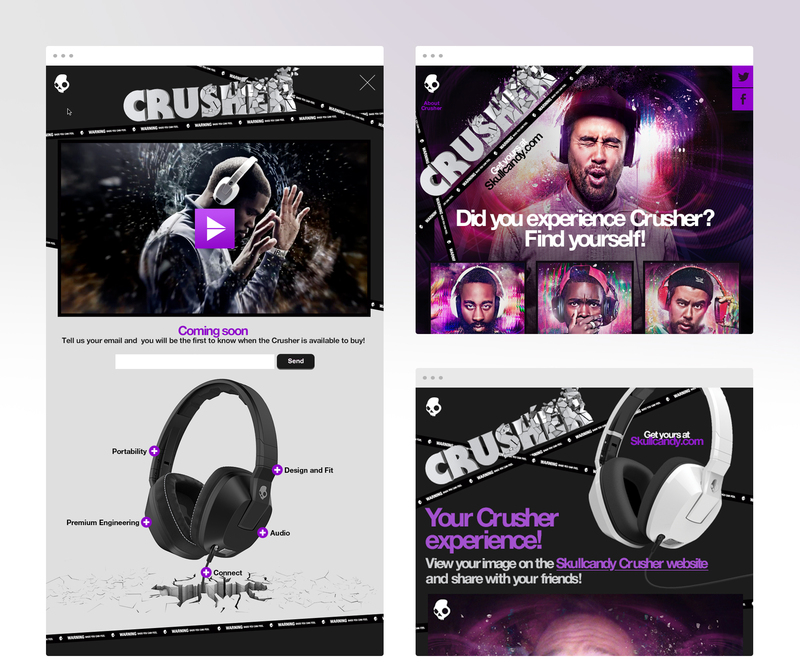 The Crusher iPad app is one of many that Knight Studios has partnered with Skullcandy to create, both with our friends in Europe and globally with the US team.